Students interested in a career in nursing have a sea of options available to them. In fact, there are so many options it may seem overwhelming to some prospective nursing students. Fear not! We have put together this guide to help you successfully work through various nursing degree programs, types of nursing schools, and frequently asked questions. After being able to thoughtfully read through your career alternatives, accredited schools, financial aid options, and common questions about nursing you will be able to align your goals and priorities with college offerings to make the best choice for your future. Let’s get going! The most popular degree in nursing will wholly depend on the area of specialty and your specific geographic location. As such, we have provided a detailed look at a variety of nursing degrees and certificate programs to help you navigate your career options efficiently. We will start with certificate programs, move to undergraduate nursing degrees, and finish with graduate degrees in nursing. A CNA certification program last from six-months to 18-months depending on the design of the program. The longer CNA certification program combines both in-class instruction and hands-on clinical training. The CNA certificate program is available at a community college, vocational school, and a variety of accredited training institutes. A certified nursing assistant certification will provide you with direct interactions with patients under the direct supervision of an RN, LPN, and/or LVN. Both the LVN & LPN tracks provide students with skills and knowledge of basic nursing care under the supervision of doctors and/or registered nurses (RN). Licensed vocational nurses and licensed practical nurses can work in a variety of settings in the healthcare industry. Examples of work environments include hospitals, nursing homes, private residence, extended care facilities, and physician’s offices. In most cases, the LPN and LVN acronyms are used interchangeably across the country. The exception to this rule of thumb is for qualification of nursing professionals in Texas and California. There are four primary types of associate degrees we will discuss in this career guide that include: Associate Degree in Nursing (ADN), Associate of Science in Nursing (ASN), Associate of Applied Science in Nursing (AAS), and Associate of Nursing (AN). Associate Degree in Nursing (ADN) is essentially the entry-point for a student looking to enter the field as a nurse in the United States. To become an ADN, students must successfully pass an accredited, board approved program followed by successfully passing the NCLEX-RN test. As a side note, all nurses are individually credentialed through their state nursing boards upon completion of a board-approved college program and passing the NCLEX-RN examination. Although each state determines the length of the program, most ADN programs can be completed in two years. The Associate of Science in Nursing (ASN) degree program is a two to three-year degree program depending on the college and state of residence. ASN degrees can be earned from a community college, 4-year college, public university, qualifying hospital, and vocational school. An ASN degree program is organized to provide students with the skills to manage direct patient treatments, clerical duties, and a variety of other responsibilities in the health care sector. An Associate of Applied Science in Nursing (AAS) track is created as a pathway for students to become a registered nurse (RN). The AAS program is typically a two-year program that fuses classroom learning with clinical experiences and lab practica. A sampling of courses expected while taking AAS coursework include: biology, anatomy, pharmacology, healthcare administration, biochemistry, physiology, and microbiology. The Associate of Nursing (AN) program is often a two-year program with prerequisite courses such as English, math, physiology, and anatomy that can stretch the program to three or more years. The AN program is yet another educational track to a career as an RN and serves as a vital connection between patients and doctors. Options for a bachelor’s degree is most often known as the Bachelor of Science in Nursing or BSN. Although infrequently used, The Bachelor of Science in Nursing degree is also known as a BScN degree, Bachelor of Nursing (BN), or even Bachelor of Science (BS) with a major in Nursing. The BSN degree is designed to encompass four years’ time with a focus on career development and graduate studies. A typical BSN track includes course work in leadership, science, research, statistics, biology, healthcare administration, community health, and environmental health along with general studies in subjects like philosophy, physics, creative writing, and history. The overarching goal of a Bachelor of Science in Nursing degree is proper preparation in the workplace after successfully passing the NCLEX examination. Universities and colleges offering BNS programs offer all-in-one nursing tracks as well as pre-licensure baccalaureate nursing programs for students with no prior nursing experience. You can also find BSN nursing programs designed for students with no prior work experience or college experience. Many accredited colleges offering BSN programs have created accelerated degree programs for students. An accelerated degree is designed to compress the normal length of the degree program for students that have earned a qualifying college degree in a different areas of study. Accelerated degree programs of this type are often known in academia as Second Degree Nursing programs. A second degree program can run from twelve to eighteen months to earn a bachelor degree and closer to three years for a master’s degree. Accredited colleges and universities offering a Master of Science in Nursing (MSN) offer specialization for those seeking to propel their careers forward through advanced clinical training and academic mastery. A professional may choose to leverage an MSN degree to become a certified midwife, clinical specialist, certified anesthetist, or nurse practitioner. As an example of specialties, a nurse practitioner can specialize in the following: family, geriatric, adult, pediatric, emergency, nephrology, cardiology, primary care, neonatology, oncology, school health, and women's health. Examples of non-clinical tracks for students earning an MSN degree include: nurse educators, managers, administration, leadership, and teachers. The Doctor of Nursing Practice (DNP) is the highest degree that can be earned in nursing known as a terminal degree. The typical DNP curricula builds upon the master-level curricula by extending learning in systems leadership, quality healthcare practices, and empirical data. Many accredited colleges have specifically constructed the Doctor of Nursing Practice (DNP) track to run parallel with related doctorate programs in the healthcare sector such as medicine, psychology, dentistry, and pharmacy. In addition to the DNP, accredited colleges offer a doctorate degree that allows students to earn a PhD upon completion of the program. The overarching goal of a PhD program is to prepare nurse scientists with key skills and industry-specific knowledge for a non-clinical careers path. Examples of non-clinical careers for PhD holding nurse scientists may include nursing education, research, and healthcare administration. Put another way, PhD programs in nursing are research-intensive environments while DNP degree programs are an immersion experience in nursing practice. Job Description: A CNS works in a hospital, medical office, health care facility, & clinic providing consultation and direct patient care. A CNS is often involved in facility administration, research, and education. Career Options: Pediatric Clinical Specialist, Critical Care Clinical Specialist, Cardiothoracic Clinical Specialist, Clinical Wound Specialist, Clinical Liaison, Post-Acute Clinical Navigator, Clinical Administrator. Job Description: At its core, a Registered Nurse is a general care nurse. RN's are focused on helping to promote positive health choices, prevent illness, and provide general care. RN's must be astute and inquisitive with the ability to home in on an issue and ask pertinent questions to develop quality care plans for a variety of patients. Job Description: A Nurse Practitioner is trained to carefully analyze, diagnose, and treat patients for a variety of ailments. In most states, Nurse Practitioners can perform health screenings, prescribe medication, treat a variety of injuries, and diagnose illnesses. Job Description: Oncology Nurses work directly with cancer patients. ON's educate and care for patients undergoing cancer treatment as well as with those in remission. An Oncology Nurse is trained to assist in radiation therapy, prescribe medication, monitor patients, manage symptoms, and help manage chemotherapy treatments. Job Description: A Pediatric Nurse works with children from birth to adolescence. Pediatric Nurses guide family members and patients on best health practices to avoid illness, disease, and infections. Additionally, pediatric nurses are equipped to help provide important nutritional guidance to family members for the benefit of children. Job Description: Gerontology Nurses mix quality health care guidance with psychology, social science, and behavioral science. GN's are trained professionals that focus energy and expertise to care for older patients with needs that can include chronic disease management to physiological changes from aging. Job Description: A Primary Care Nurse is trained to work directly with an individual patient for extended periods of time. Primary Care Nurses can work in a number of settings that can include a clinic, hospital, or in-home care. Job Description: Dialysis Nurses learn to treat patients suffering from kidney failure in an effort to help improve kidney functionality. Dialysis Nursing is a specialization within a broad learning domain called nephrology. The field of nephrology entails pediatrics and medicine associated with normal kidney function & kidney disease. Job Description: Public Health Nurses are highly specialized nurses that assists organizations and communities understand diseases, treatments, and prevention measures. PHN's are equipped with a broad-based education that includes gerontology, early childhood development, counseling, parenting, and coaching. Job Description: The informatics field emphasizes the utilization of health care information, the dissemination of data, storage of information, and communicating real-world applications from a variety of datasets. The field of nursing informatics melds health care with information science and computer science in an effort to better manage information for patients, providers, insurance carriers, and hospitals. Job Description: Cardiac Nurses are highly specialized nurses that work directly with patients suffering from heart conditions. A Cardiac Nurse works under the supervision of a cardiologist or equivalent doctor to assist patients with a variety of heart conditions. Examples of common heart conditions a CN will be involved with include congestive heart failure and coronary artery disease. Job Description: Emergency Room Nurses are trained to work in a high stress, fast-paced work environment. ER Nurses are called upon daily to quickly, accurately assess health conditions and provide treatment for life threatening injuries to benign medical issues of all kinds. Job Description: Practical Nurses and Licensed Practical Nurses are professionals that are trained in a similar fashion to Registered Nurses. LPN's are trained to provide medication administration, perform a variety of injections, and manage health assessments. Practical Nurses will work under the supervision of a Registered Nurse while performing clerical and health activities approved by the facility manager and resident RN's. Job Description: The field of Forensic Nursing is a newer area of study blending the field of law with health care. Job duties of a forensic nurse can range from providing courts with legal testimony evidence to working with victims of violent crimes. Job Description: Specialists that work with patients over 50 years of age. Geriatric nurses care for patients by easing pain, hygiene assistance, routine assessments, and general treatment plans. Job Description: A Travel Nurse works in various settings for short intervals performing a wide variety of tasks. Duties can vary depending on the needs of the facility and patients thereby ensuring a diversity of duties from day to day. Daily tasks are highly important to keep a facility running efficiently yet rarely critical, life-saving activities. Career Options: Endless options in various sub-disciplines including ER, ICU, Oncology, Dialysis, Neonatal, Perioperative. Job Description: Adult Health Nurses work with patients of all ages with acute and chronic illness or diseases. Some AHN professionals create long-term care plans for patients while others support treatment plans through a variety of methods. Job Description: Endoscopy Nurses work with an endoscope team within a hospital to understand and assess problems within the genitourinary or digestive system. Job Description: An OB GYN Nurse is a specialist working to treat and understand the female reproductive system. The acronym OB GYN stands for Obstetrics and Gynecology as it blends the two disciplines. There are 3 primary types of nursing schools to select from including Vocational or Trade Schools, Community Colleges, and 4 Year College or University. Each type of school has important value to offer students and worth considering for your future. We have created a succinct overview of each to help you best determine what type of school is best for you. A Vocational or Trade School offer specific job-readiness training for students. These types of schools create curriculum to ensure students receive skills focused on a specific trade or vocation and is seen as an efficient path to the work force in terms of both time and tuition invested. 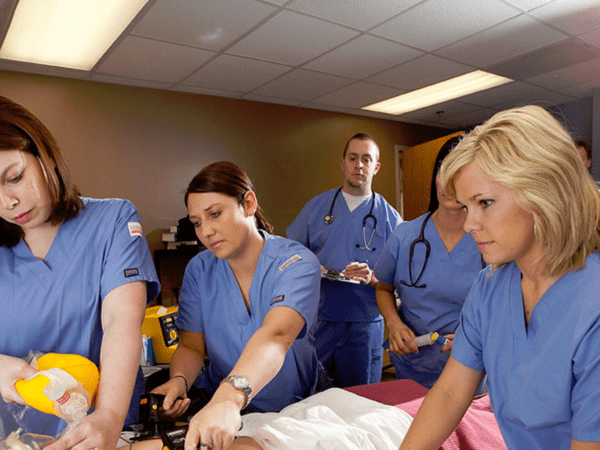 Generally speaking, a Vocational or Trade School will offer individual courses in practical nursing along with an array of programs for nursing assistants. In addition, there are a large number of Vocational or Trade Schools that offer certificate programs for nurses. A Community College will offer a two-year program with a direct path to an associate-level degree. The Community College model allows students to more rapidly move towards a degree than a four-year school while gaining a valuable education within an accredited institution resulting in faster access to the workforce. By in large, the most common nursing program within the Community College system is the Associate of Science in Nursing (ASN). Another popular path for students attending a Community College is a vocational program for those seeking a certificate as a Licensed Practical Nurse (LPN). A 4-year College or University offers the most comprehensive, in-depth educational option for students. In addition to core nursing programs, students will often spend time learning about adjacent subject that help them become well-rounded and curious learners. A four-year University or College will offer an array of programs from a Bachelor’s of Science in Nursing (BSN), bridge programs, accelerated programs, second degree programs, and doctoral studies in clinical and non-clinical tracks. Is it better to enroll in a traditional classroom program or online program in nursing? The short answer is that it depends. Your goals, aspirations, schedule, budget, timing, geographic location, priorities, work life, family constraints, transportation, learning style, and study habits will help determine your answer. Traditional classroom settings and online programs can both be viable alternatives for college students. You will need to thoughtfully assess which path is best for you. How important is college accreditation? Enrolling in a college holding a nationally recognized accreditation can make all the difference to your career and your future employer(s). It is recommended to search for colleges and universities with accreditations from the Commission on Collegiate Nursing Education (CCNE) and/or the Accreditation Commission for Education in Nursing (ACEN). Would you recommend talking to current students or recent graduates? Yes, we highly recommend you reach out to the college or university to request an opportunity to speak with 2-3 current or former students. A quick conversation with a peer can illuminate vital aspects of your desired program in ways an administrator or counselor cannot articulate. Do I need to pick a nursing degree program or certificate path before starting? Not necessarily but it will be a more efficient use of time and resources knowing a program in advance. So long as the college or university has a variety of degree paths, you can select a specific degree or certificate later. The inherent risk of starting a program without deciding upon a specific degree is the school may not offer the exact program you want after learning about your options. What are critical metrics for nursing programs? There are many metrics you can look at when analyzing similar programs - from enrollment numbers to acceptance rates to tuition costs. As you assess differing programs, a vital measurement tool will be to obtain the school’s NCLEX pass rates. Are all clinical rotations basically the same? In short, clinical rotation sites can vary from city to city and state to state. As you gather information about clinical rotations ask the following types of questions: do schools arrange rotations or do students; how to complete clinical requirement for online students; and how diverse are clinical opportunities in a variety of settings. How important are student to teacher ratios? The efficacy of student to teacher ratios can vary from school to school and have a divergent impact on your experience depending on your learning style(s). The lower the student to teacher ratio the more one-on-one time can be made from professors, practitioners, and clinicians. Can my academic resume help me get into a great nursing school? Improving your odds of admission to quality programs will depend on several factors including your academic resume. The more science classes (such as chemistry, microbiology, anatomy and physiology) and more humanities classes (like creative writing, English composition, sociology, psychology) the better your odds. What other factors can improve my odds of admission? In addition to a strong academic resume, important factors to consider as part of your college application can be: grades, life experience, work experience, personal character, leadership positions, volunteer activities, solid interview skills, attention to detail, professional network, robust writing skills, exceptional communication ability, and professional appearance. In other words, being a well-rounded student is far more important that simply having great grades. What are the most important skills a nursing student will learn in college? The answer we hear most often from professionals is two-pronged: medical knowledge and people skills. The medical knowledge component boils down to book smarts. Going to class, learning the basics and continuing to be eager to learn new material. Much like academic knowledge, people skills can also be learned. Developing exceptional interpersonal skills will take a great deal of practice, empathy, and mindfulness. How important is the education and clinical experience of the professors and faculty? The success or failure of nursing programs around the country depends on the faculty. A highly engaged, qualified staff will have a higher success rate than other teaching teams. When analyzing great school for you, make sure to ask about professor pedigree, teaching experience, tenure, work experience, published works, and accessibility to students. These questions will help you paint a picture of the institution and their faculty. The extra work in advance will help build a strong nursing resume and set you up for success. Financial aid can come in several different forms and you must be diligent about creating the best package. We will discuss various terms and offer resources to help you navigate the financial aid process. In nearly every case, you will want to complete a FAFSA to pair with the options discussed below. Scholarships: A scholarship is an award for college that does not need to be repaid. Scholarships can be based on merit, gender, need, ethnicity, geographic location, religious affiliation, athletic ability, honor organization, academic major, military affiliation, race, artistic ability, physical disability, state of origin, and student organization to name a few. Fellowships: A nursing fellowship is a short-term learning opportunity focused on professional development sponsored by a school, hospital, clinic, or government organization. Fellowships are most often associated with graduate school often involving hands-on learning, specialized classroom time, and exclusive academic programs. Students are paid salaries or through a stipend for participation in the fellowship. Internships: An internship or nursing residency are often paid positions for graduate or undergraduate students. An internship or residency can last a few weeks to a year depending on the program and area of emphasis. These programs will help students offset the cost of college in conjunction with other financial aid. Student Loans: Unlike grants and scholarships, a student loan needs to be repaid. Loans can be from private institutions or from the federal government depending on your specific situation. Exceptions to the rule of repayment include loan forgiveness programs like the NURSE Forgiveness Program, Perkins Loan Cancellation, State Forgiveness Initiatives, and Public Service Loan Forgiveness Program. To find the best nursing school for you, we have created a number of resources for you. The first is a search tool that allows you to target traditional college programs by inputting important criteria given your personal priorities. Next, we have online college and degree programs available for all accredited colleges that offer nursing programs to be discovered. Lastly, we have organized nursing schools by state to help you find a top ranked nursing college to fit you best. Why Choose a Career in Nursing? At the end of the day, the choice to become a nurse is a personal choice. Individuals looking to help others with an aptitude for problem solving and ample compassion may thrive in the healthcare industry. Learn more about critical care nursing, midwifery, palliative care nursing, pediatric nursing, nursing education and much more with our expansive digital library. For additional resources, make sure to visit MatchCollege and subscribe to our blog for the latest in college information.